Reason for Stay: Acute respiratory frailer with hypoxia, hypertension, cardiogenic shock and generalized muscle weakness. Ms. Kearney was admitted to The Grand Pavilion from LIJ Medical Center on June 8th, 2018. Ms. Kearney had experienced acute respiratory failure with hypoxia, hypertension, cardiogenic shock and generalized muscle weakness. Upon arrival to The Grand Pavilion, Ms. Kearney and her family were greeted by both the nursing team and Mark, our concierge, and then went on to meet with our rehabilitation team, dietician and social worker. The entire team was excited to get to know Ms. Kearney. She was an extremely pleasant and upbeat person and although upon admission she was not in the best of shape and was suffering from very unpleasant diagnoses, she came to The Grand Pavilion with the hopeful goal of rehabilitating and returning home safely. Prior to being admitted to the hospital, she lived with her daughter. Ms. Kearney has two beautiful daughters that are extremely dedicated to her care, they both were always here at The Grand Pavilion visiting their mother. Ms. Kearney was a big participator in our therapeutic recreation programs. She loved attending movie nights and she immensely enjoyed the group sing along and art classes. Ms. Kearney worked in an accounting firm in Valley Stream and her late husband was an executive salesman for ABC Television. Her fondest memories are of her time spent with her late husband; they shared a loving relationship for over 50 years. Ms. Kearney favorite hobbies as she shared, are gardening and cooking from time-to-time. Overall, she has a strong appreciation for living and enjoying life. Following Ms. Kearney’s hospitalization, she was admitted to The Grand Pavilion for rehabilitation. 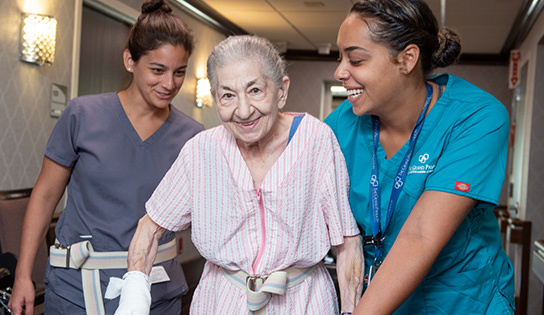 During her initial evaluation, Ms. Kearney presented with a significant decrease in strength, impaired balance, and difficulty performing bed mobility and transfers. Her challenging aliments prevented her from successfully completing standing activities as well as reducing her functional activity tolerance. Ms. Kearney also required total dependence with activities of daily living, such as self-feeding, dressing, hygiene, and grooming. Ms. Kearney also required total dependence to sit up from the edge of the bed. She was unable to maintain static sitting balance independently and would require a Hoyer lift to get out of bed to her wheelchair. Prior to her hospitalization, Ms. Kearney was independent with all her activities of daily living and was ambulating in the community independently without any assistive device. The goal of occupational therapy was to increase Ms. Kearney’s independence with self-feeding and improved sitting tolerance in her wheelchair. Techniques that were used to achieve her occupational functional goal included neuromuscular re-education with goal-specific tasks during treatment sessions. Ms. Kearney participated in therapeutic graded exercises, bicep and tricep curls, exercises with gymnastic equipment, proprioceptive techniques while at the same time participating in strengthening activities and dynamic functional activities in physical therapy. Ms. Kearney was evaluated by our speech language pathologist in efforts of evaluating Ms. Kearney’s moderate oropharyngeal dysphagia. It was the goal of speech therapy to support Ms. Kearney in tolerating a regular diet and to be able to enjoy thin liquids without any difficulty. Ms. Kearney had made significant progress during her past two months spent in skilled rehabilitation sessions. Ms. Kearney began to tolerate standing for up to five minutes with assistance of one person. With improvement in her dynamic balance and standing tolerance, Ms. Kearney was able to ambulate up to 75 feet with a rolling walker under moderate assistance of one staff member. Ms. Kearney currently requires set-up assistance with self-feeding compared to total dependence during her initial evaluation in occupational therapy. Ms. Kearney has been upbeat and motivated throughout her entire journey. She loves to work throughout her therapy sessions with music to keep her motivated throughout the healing process. When our Director of Concierge Services met with Ms. Kearney closer to her discharge date to discuss her experience, she was full of appreciation. She expressed how the nursing team were so kind to her and assisted her with every request. She truly believes that her rehabilitation journey was a true success story. She shared great appreciation to the therapists, expressing that her daily visits to the gymnasium inspired her to continue exercising and pushing. Ms. Kearny expressed her appreciation for the entire Grand Pavilion team. We are so glad that we were able to guide Ms. Kearney through the journey of healing.